When I was born, my owners had plenty of money. The husband worked in the city, in ‘The Bank’, and the wife had no job as such. She bred us Dalmatians and spent of lot of time walking us on Hampstead Heath. She had lots of friends who were all ‘doggy’ people. They used to arrive in their big ‘four by four’ vehicles, usually with at least two dogs for us to play with. My brothers and sisters all disappeared one by one usually in one of the big cars that arrived. My mother and I were the ones that our owners wanted to keep. They were very fond of us. We made them laugh and they never tired of telling stories about us to their ‘doggy’ friends. One day the husband returned home looking very pale and worried. I might not be very clever but I knew I should not jump up to greet him that day. He didn’t even look at me. He came in and collapsed on the sofa, his head in his hands. I lay quietly and waited. When his wife came into the room she took one look at him and went white. “Has it happened?” she asked. He nodded his head. They both sat on the sofa and wept. The next thing I remember was men arriving in a big van and taking all their expensive furniture away. Soon the house was empty. A ‘For Sale’ sign went up outside the front gate. My owners put us into a van with wire mesh on the windows. They patted us sadly and the wife said: “Be good dogs, you’ll be all right. Someone nice will find you.” We didn’t understand why we were being sent away. We knew our owners loved us. We felt very sad. We didn’t wag our tails, but barked anxiously until we were too tired to bark. We were taken to a long building. Inside it were rows of cages. It was cold and smelly. There were lots of dogs, one or two in each cage. Many were barking. We were afraid. Some dogs lay looking sad or asleep at the backs of their cages. We were put into a cage together, my mother and I. I sat very close to her. I had been feeling sad, missing our old owners and thinking I could never love anyone else, nor be happy in a different home, but I saw that my mum was right. Sure enough, when a family chose me, I wagged my tail and made an effort to be happy. There were children in the family and I could tell they were not used to dogs. I had to be very patient with them, though sometimes I felt like biting them. When they pulled my tail I would just growl a little and their mother would tell them not to do it. 1. What would you call this story? 2. Does it remind you of anything in your life? 3. 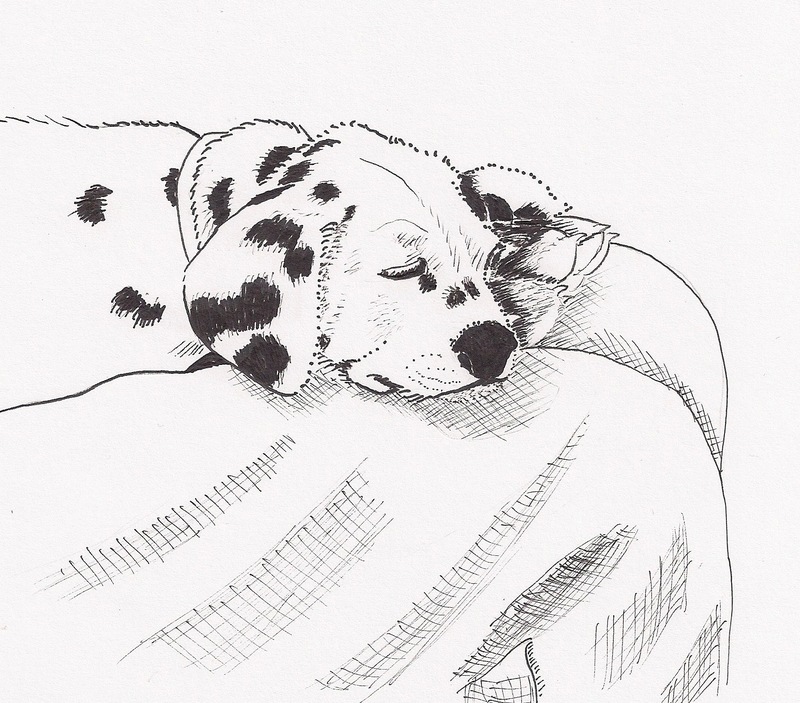 What do you think might have happened to Dotty’s first owners to make them send Dotty away? 4. Sometimes difficult things happen in our lives and we have to find ways to deal with them. Which of these did Dotty do? She was only a dog. Think how much more a person could do….. In the days when men and women roamed the plains and young people had to go through an initiation ceremony before they were accepted as adults, there was a young man. He was Grey Wolf. Now this young man was a gentle person who never wanted to hurt anyone or anything. This made life rather difficult for him, because the Red Man survives by cooperating with animal life, respectfully asking permission to kill, and then killing for food and clothing. The time came for Grey Wolf to perform his initiation. He had to kill a buffalo. There were many ways to tackle this challenge and Grey Wolf decided that he would get us, his family, to dig a pit on the edge of the forest. His plan was to drive the buffalo into the pit. We dug, all of us. It was a huge pit. My father said it was big enough to catch the whole herd, but he was exaggerating somewhat. We covered the pit with branches and leaves so that it looked just like the rest of the forest floor. It was time for my brother to go. Now he was a very fine horseman. He and his horse moved as one. The horse could tell from the angle and the slightest pressure from his body where he was required to go. A few hours later we heard a great crashing through the trees. It was Grey Wolf. He was driving two buffalo towards the pit! We looked on in amazement. Certainly and surely they neared the hole in the ground, and one after another they fell into it . The buffalo charged into the pit. And the Chief bestowed an eagle feather head dress upon him. We all looked on in admiration. My brother may not have enjoyed killing, but he knew what had to be done for the survival of the tribe. We must eat, and buffalo is our main source of food. My brother, after that, used to be chosen to do the chasing, and left the killing to the others, but it is all one really. He who eats meat is acknowledging that it is part of Gods plan both in the animal kingdom and in man’s domain. The base energy centre is situated at the bottom of the spine. It is associated with survival, bravery, hunting to feed oneself etc. To learn more about this centre go to yogastories.co.uk and look at information on the base chakra in the contents page. There was a young girl in my tribe, she was known as Rainbow Dancer. A beautiful girl, popular with everyone, several young braves hoped that she would choose one of them. She always wore the finest leathers. She plaited her hair so neatly and tightly and interwove it with ribbons of cloth that she had dyed different colours. Rainbow Dancer was waiting. She knew she must wait for the right man, as none of the young men in the tribe appealed to her. Her mother had told her that when the right man came she would feel it in her belly. She did not understand her mother’s words, but she was happy to believe her. At tribal gatherings when the dances were in full swing, Rainbow Dancer was aloof. Unlike her name suggested, she never wished to dance. As a young child she had danced a lot, but somehow it had lost its appeal to her. Perhaps because when she showed that she was willing to dance she had the problem of dealing with all the young braves who wished to be chosen by her. She had decided it was easier not to bother. Several years went by. All of the girls of a similar age found husbands amongst the tribe, but Rainbow Dancer was adamant. She felt nothing in her heart and nothing in her belly. One day two young men stumbled into the camp. One of them was wounded. He had been trampled by buffalo in a stampede. Somehow they had lost their way and their companions had gone on, not realising that Standing Tree was wounded. Rainbow Dancer’s mother was first to see the young man. She dressed his wounds and made him a comfortable place to rest in a tepee adjacent to her own. Rainbow Dancer helped her mother to look after the young man. He was in a lot of pain and developed a raging fever. It took a lot of skilled use of herbs and patient watching and waiting before Standing Tree was able to speak. Every movement was painful to him. Rainbow Dancer mopped his brow and dabbed his wounds with the herbal medicine. Rainbow Dancer felt her heart lurch. She knew that the thing she most wanted in the world was for Standing Tree to recover. Gradually he became strong again. Rainbow Dancer helped him to walk around the camp to get used to using his limbs again. She noticed that when she touched him she could feel a current of energy flow through her body. She began to feel warmth in her heart, and just as her mother had told her, she felt the stirring of excitement in her belly. This was the man for her, her body told her so. Standing Tree felt the same way. When he had completely recovered he told Rainbow Dancer that he must return to his tribe, but that he would come back for her very soon, which he did. He brought with him a token of his love for her and asked her father if he could take her to join his own tribe. Rainbow dancer’s father agreed and the couple had a happy life together. The solar plexus is below the ribs and above the naval. It is the main energy distributor in the body, it helps in the thinking processes (gut feelings) and it connects us to others. In times when men and women lived in teepees on the plains and in the forests of North America, there was a young warrior, we shall call him White Owl. He was a brave young man, never afraid to get others out of trouble, whether he had to fight off adversaries or wild animals. One day this young man and his friend Grey Wolf were deep in the forest. They were hunting for the wild bears who roamed freely in those days. These are very fierce animals. They were required for their coats for the winter bedding especially for young children. Winters were very cold indeed and the animals had to be sacrificed to keep us humans alive. On this occasion Grey wolf was climbing a tree having disturbed a bear, thinking that the bear would not dare to climb as high as he could. He hoped the bear would use his solar centre – his mind centre, and realise that he would not be safe on the fine, high branches. However the bear continued up and up and Grey wolf began to think that he would soon run out of tree! Now White Owl his friend saw the dilemma and decided to act as a decoy for Grey Wolf. He shouted and threw sticks at the bear who looked down and saw a second adversary at the base of the tree. The bear had been starting to get a gut feeling that it was about time to turn round and go down again. Now he had even more reason to do exactly that. With a huge bellowing roar he reversed down the tree. This was a slightly slower process than climbing up. White Owl looked at his weapons, he had a tomahawk and a bow and arrows. He and Grey Wolf had spent many a long evening practising their tomahawk throwing by the light of the moon, and he was very accurate. He decided to risk throwing the small axe, which is what it was, planning the throw to coincide with a difficult part of the descent of the bear. He did not have time to think of any other solutions. That he would leave to the Great Spirit. The young men skinned the bear on the spot, leaving the carcass for the wild beasts which would surely find it. They carried the skin home to their families, proudly presenting it to be shared by their mothers for the youngest children in each family. They had been happy to risk their lives in this way for those with whom they had close ties, another solar plexus connection. For a fuller description of the functions of the solar plexus energy centre go to www.yogastories.co.uk and click on the contents list. Go down to the last chapter and click on ‘information on the solar plexus chakra’.